P-Noy’s farewell SONA fails to tackle tough issues such as Mamasapano, climate change, US involvement, credible elections, horrendous Metro traffic and messy mass transport, etc. But perhaps, P-Noy’s speech-writers were correct: better a fun-SONA. I can understand the angst of those who deplore President Aquino’s having devoted easily 45 minutes of his two-hour twenty-minute SONA to a comparison of his five years in office with the eight years of former President Macapagal-Arroyo---inevitably sounding like a long-playing detraction of that former regime, or a broken record. For the longest SONA in our history did sound like that---drowning its audience with a million and one minutiae about how much P-Noy’s administration had accomplished compared to GMA’s, and his acknowlegment of his loyal subalterns. After a while its sheer length bore some listeners outright. I spotted some former high-ranking officials in the VIP gallery falling asleep (among them President FVR, chic in his veteran’s beret), and a couple of ambassadors. So detailed was the SONA that it sounded like a country club trying to impress shareholders.But then, how else would P-Noy be able to impress his audience if he does not use the GMA years’ record of governance, especially in the economic field, as stepping stone. What he did not say, however, was that it’s inevitable that there would be increments in every aspect, from school-buildings to customs collections, from roads and bridges to Phil-health enrollees, from PNP pistols to AFP tanks (the only stat that did not increase is the no. of C-130s---still only one flying). This is because population has been increasing and so have revenues and needs. But the more particular reason P-Noy needs to drown out his listeners in statistics and aggregate sums is that it’s easier to hide the fact that after starting in a grand manner in 2010 to 2013, with all the big expectations, the economy has began to falter. Ateneo Prof. Joseph Anthony Lim, a former UP professor who joined a group of State University academics in conducting the traditional (7th year now) Pre-SONA assessment of the presidency, pointed out that the P-Noy years from 2011-2014 registered higher GDP growth than the GMA years 2002-2008, due to higher business and foreign confidence as evidenced by investment upgrades by Moody’s Fitch’s and S&P and (perceived) improvements in governance and fiscal balance. Starting the 1st quarter of 2015, however, Prof. Lim points out, the GDP started slowing down to 5.2%, compared to 6.6% in 4th quarter of 2014, this latter already revised downwards from 6.9%. On the other hand, GNP growth for the same 1st quarter 2015, registered even lower with 4.7%. In addition, continued Lim, PH growth in 2014 of 6.1% missed government target of 6.5%, and projected growth for this year “would most likely again be below government target of 7-8%---given our 1st Q growth of 5.2%." In addition, the economist noted that “Overall there may be some improvements in unemployment and under-employment BUT THEY ARE NOT STRIKING (underscoring BOC’s)." In other words, P-Noy’s statisticians and speech-writers obviously---and smartly---wanted to leave a picture of growing economic strength on his farewell SONA, but signs of weakening are all over the place. So what better way to shake the waters at this point, than by comparing aggregate sums of progress with those of the immediate past---and to Aquino fanatics unlamented---regime? But in projecting impressive stats that leaped out of the Batasan screens in upward-shooting columns on various aspects of life in PH, the President skipped so many topics that the Filipino people wanted to hear from him as Father of the Nation. Topics which have been most problematic in the life of the people, that touched their daily lives and seared their innermost emotions and which have rent the people apart. For instance, Flavio Sagonoy, father of PO1 Joseph Sagonoy, one of those who perished in the bloody and tragic Mamasapano encounter---the SAF 44 or Fallen 44---was quoted lamenting that P-Noy toasted everyone in his Cabinet and staff, including his cook (and the public indulged him as it was a paalam); but he failed to even mention the brave young PNP servicemen who figured in the bloody encounter they did not fully comprehend nor control. This is a valid lament from a grieving father but then, think about it, how could P-Noy have touched on this topic without apologizing for the death of those brave young men and owning up to his responsibility to them and the nation? 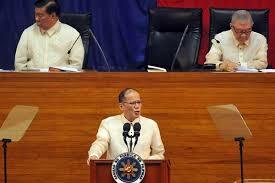 I’m so glad P-Noy batted for passage of the Anti-Dynasty bill---the most applauded of all he said that evening. I was one of those who clapped, stumped my feet and screamed lustily for it (now, if only Their Honors would all vote for this bill!). But in a later moment of sobriety some folks pointed out that while P-Noy had shown only lackluster support for the FOI bill all these years, now he was pulling it out of the legislative closet with one purpose---to dig into the vulnerable side of his arch enemy, Vice President Binay, leader of the Makati dynasty. Missing in action in the SONA, too, was P-Noy’s support for the Freedom of Information (FOI) bill, one of his much-applauded campaign promises; but then, wouldn’t an FOI Law complicate his life and those of some of his Cabinet members in the coming years of retribution? No word about how he planned to leave as legacy the battle vs. Climate Change, the most urgent issue facing our planet today---and our country after Yolanda. P-Noy made a passing reference to improvements in Pag-Asa, but it will be recalled that he used its chief, Nilo Prisco, as scapegoat after the terrible storm hit our country, when the culprit was the failure of various administrations to upgrade beyond tokenism the weather-bureau’s facilities. But then, had P-Noy tackled Climate Change he would have had to explain why until now 2/3 of the nearly 300,000 rendered homeless by Yolanda In the Visayas, especially in Tacloban, are still in tents. No assurance about how he intends to keep the 2016 elections clean, honest and credible and that Smartmatic, discredited in many places around the world and more recently in the US, would be shut out of our political life forever (after all, he had won); or how to minimize US interference despite the China threat. P-Noy sought to tackle the poverty issue by praising to high heavens the Conditional Cash Transfer program---now a whopping P63 billion and said to cover 4.4 million households, up from only 786, 523 households when he came into power in 2010--- by citing testimonials about how some families were able to escape poverty through this outright dole-out program that, supposedly, keeps schoolchildren in school (its primary objective). But think of how many more would be helped in more significant ways if the CCT gargantuan funds are channeled to more meaningful ways, e.g., expanding TESDA to various regions and beginning technical training among high school or elementary drop-outs who really need help. I have long held serious reservations about this CCT program—because I’ve heard stories about how unscrupulous grassroots operators give out only half the dole-outs to the poor and keep the rest to themselves. My beef is mainly the difficulty in proper recording and monitoring of the huge dole-outs. Above all, there was nothing in his speech about how to alleviate the terrible plight of tens of thousands of inhabitants of the Greater Metropolitan Manila who daily have to suffer the worst traffic jams in the world---now compounded by floods, periodic breakdowns of the MRT which pose such public danger, and occasionally those of the commuter trains. Life is getting better? Tell that to the tens of thousands of mothers who have to fight out the daily mad scramble for scarce rides, reach home by 9 pm. with their children already asleep and who have to leave the house by 6 am., while kids are still asleep, to get to work by 8 am.? On second thought, the President’s speech-writers are right: he should have stuck to his fun SONA of yesterday. Implications of the INC family feud on the political scene (on the eve of crucial presidential elections in May 2016). Seven UP professors from various disciplines render their pre-SONA assessments in the best Center for People Empowerment in Governance (CENPEG) tradition. 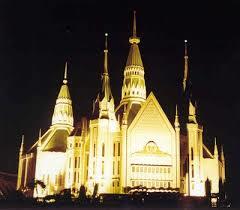 The 101-year old Iglesia ni Cristo's central church on Comonwealth Ave. in Quezon City, all lit up. In retaliation, Ka Eduardo, on the advice of his top senior ministers, expelled the rebel group from the church. But understandably, what’s said to upset church members somewhat caught in the middle of this mighty feud is the way Ka Eduardo treated his mother. Filipino culture being what it is, such behavior is tough to reckon with---a study in sociological realism. It is hard to tell how deep the schism is at this unprecedented stage, but what makes it so compelling is that it’s happening not only during the grand 101st anniversary of the INC, but also on the eve of crucial presidential elections in May 2016, where President Aquino seems to be staking his all on his anointed candidate in the hope that he would escape political prosecution. The INC is so powerful because of its command vote in every election, from the highest post down to the grassroots. Politicians high and low have courted its crucial support each time and in return they have quietly reciprocated with favors---primarily with the appointment of INC members to various posts in the judiciary, the armed forces and the police, as well as in top-level bureaucracy. Now that the veil over its monolithic strength has been rent and cracks have appeared on the dome, would this solid vote command the same intensity? Would the INC remain the king-maker that it has been? Note reports that the recent appointment of the PNP Chief is allegedly owed to the INK. Noteworthy watching, therefore, is how the investigation of the alleged kidnapping of a group of ministers will be handled by the NBI, following the recent order of DOJ Secretary Leila de Lima. It was interesting that the day after the INC crisis broke out, the chief of police of Quezon City was already alleging that there was no abduction of anyone. Interesting too, was Angel Manalo’s denial of detention---some media attributing it to duress. It's understandable that Ka Tuning Taberna and Kumbanchero Jerry Baja won't comment about the INC crisis. But note that no politician has been caught commenting on it---their lips are tightly sealed, but they’re all watching developments with beagle eyes. This is really just abangan. 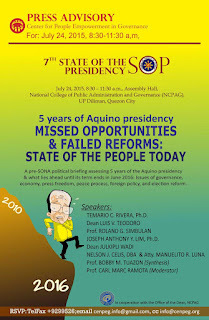 Every year on the eve of the President’s SONA for the past seven years, the Center for People Empowerment in Governance (CENPEG), composed of leading faculty members of UP in various disciplines, invites media and other parties to the UP National College of Public Administration & Governance in Diliman, to listen to key professors’ annual assessment of the “State of the Presidency” for the year past. I have studiously followed these assessment sessions of CENPEG every year and found them very interesting and informative. In earlier years of President Aquino’s administration it was evident that even the normally acerbic and critical UP profs were giving him the benefit of the doubt on governance, but last Friday’s assessment by the seven professors was darker than ever before and quite pessimistic. 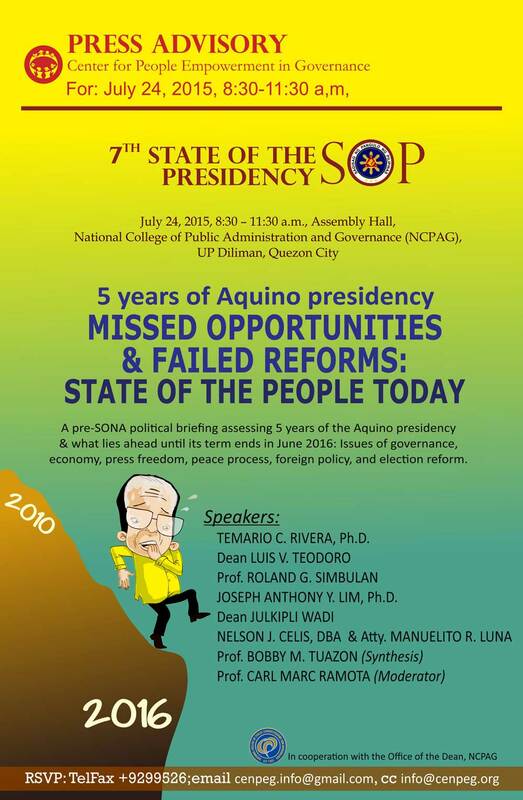 Their papers’ over-all title and theme, “Five years of the Aquino Presidency, Missed Opportunities & Failed Reforms: State of the People Today,” said it all. Prof. Joseph Anthony Lim of the Economics Dept. of the Ateneo University and a retired professor at he UP School of Economics, who trained at the Massachussetts Institute of Technology and Univ. of Pennsylvania, pointed ou in his paper titled “The State of the Economy: Did P-Noy Deliver to His Bosses,” that the GDP growth in the first three years of P-Noy (2011-2014) were higher than that of the GMA years (2002-2008). This was despite lower growth in exports and OFW inflows. This phenomenon was due, said Lim, to higher business and foreign confidence (investment upgrades from Moody’sm, Fitch, S&P’s) and higher government constructing and spending (DAP). In the Global Competitive Report of the World Economic Forum, Dr. Lim cited improved PH’s over-all ranking from 2011-2014 from 85 to 52, in governance from 117 to 67, and in ethics and corruption, from 135 to 81. But he also noted that it also showed “bad results” in “bad infrastructure,” where PH is stuck at rank 91, airport infrastructure at 108 and seaport infrastructure at 101, and peace and order, security situation at 89, and threat of terrorism on businesses at 110. (To be continued: Gists of papers of Professors Luis V. Teodoro, “Free Expression and Press Freedom in Aquino Administration;” Roland G. Simbulan, “Trends, Zigzags, Pitfalls and Gains in P-Noy’s Foreign Policy for the Past 5 Years”; Julkipli C. Wadi, “”On the Mindanao Peace Process & BBL”; Nelson J. Celis, “Presidency’s Performance in Electoral Reform;” and Atty. Manuelito Luna, “The President’s Comelec: Blunders & Views.” And “Synthesis” by Prof. Bobby M. Tuazon.